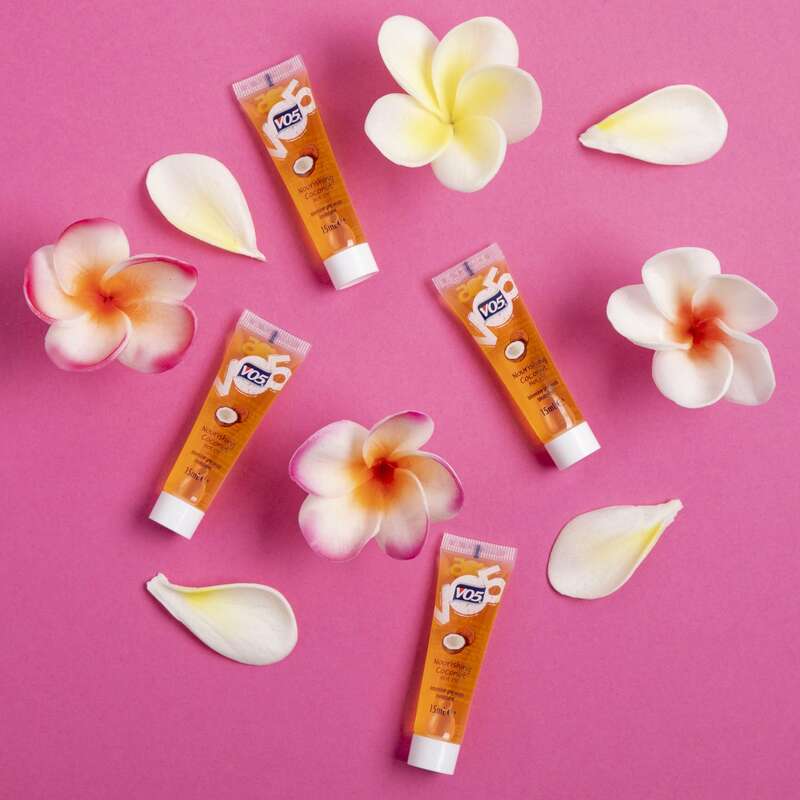 Your strands will love the new VO5 hot oil treatment! Dealing with dry hair? Whether its down to your hair type, the weather or good ol’ hair damage, your mane can certainly benefit from trying the new VO5 Nourishing Coconut Hot Oil (yes, after a long hiatus they’re finally back with an upgraded formulation!). You may have heard of hot oil treatments, but do you know exactly what they can do for your tresses? Lots – that’s what! And lucky for you, we’ve listed 7 detailed reasons why you should incorporate them into your A/W hair wardrobe, below. There are some things in life that are too good to live without. 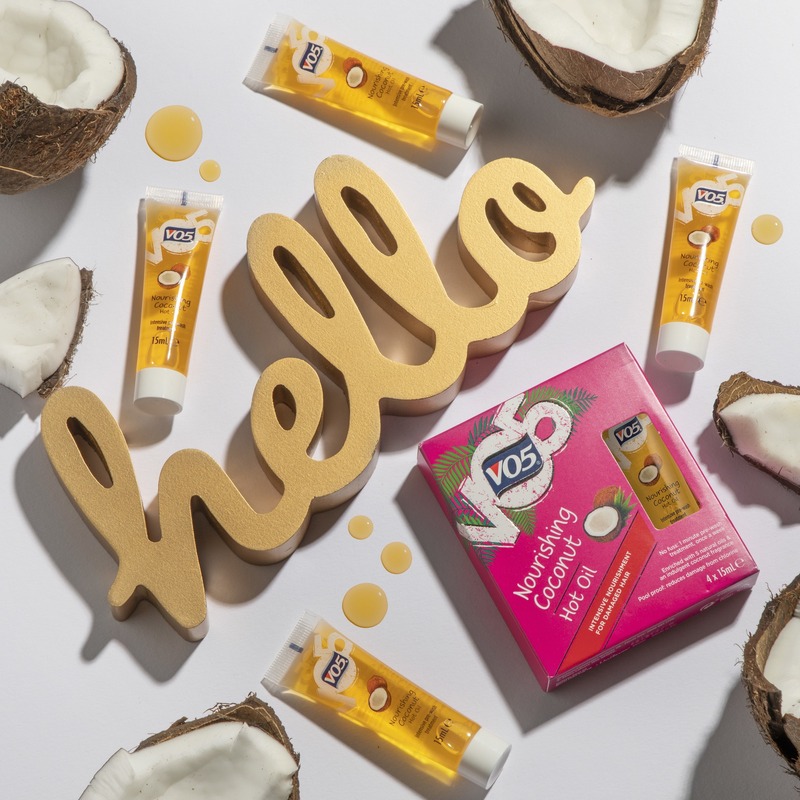 The year is 1976: The Bee Gee‘s are ruling the charts, everyone wants Farrah Fawcett hair, oh, and VO5 have just launched their original hot oil treatment in time for summer. While it might not be so easy to get Farrah’s iconic Charlie Angels look, VO5’s moisturising oil treatment is giving our strands the star treatment it deserves by restoring its shine and revitalising dry, dull tresses. Retaining the hair-softening properties that made this product iconic back then, the 2018 VO5 Nourishing Coconut Hot Oil now tackle modern-day hair stresses (think pollution, excessive heat styling, dryness and damage) – all in 1 minute. Ah, miracles do happen! Okay, now for more benefits! When used as a weekly treatment, they can work to strengthen your delicate or damaged strands by bonding together the weak sites of every strand*. The result? Less split ends, meaning less breakage and healthier-looking hair. VO5 hot oils use the power of heat to restore moisture in dry, dull locks, by penetrating deep within the hair. Regular hair oils are designed to penetrate the cuticle, manipulating change in the hair structure, rather than simply coating it – and heated oils work even better. Unlike other leave-in hair oils, you should thoroughly rinse this hot oil treatment out. If you colour your hair, then you’ll know how quickly your mane can lose its brightness. Fret not, because the VO5 hot oil treatments will help to boost colour vibrancy in dyed locks. By keeping dry/damaged hair at bay with this weekly paraben-free treatment, your pretty hue will look more vibrant. 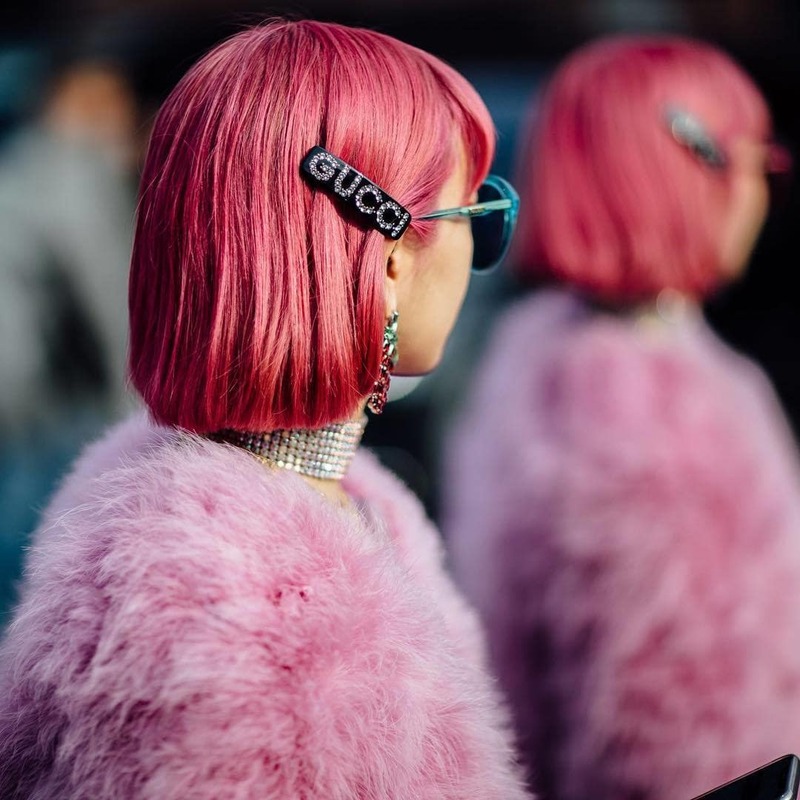 Recommended: The hair colour trends we’re living for. “The VO5 Hot Oils remove up to 70% more chlorine from the hair,” says Dan. As you probably know, chlorine can be damaging for your hair, so if you’ll be spending a lot of time in the pool this summer, you’ll need to ensure that you spend an extra few minutes rinsing your hair to remove any chlorine residue. Luckily, the VO5 hot oil treatments help to remove chlorine from your tresses compared to just shampooing alone. Plus, their compact size means they won’t take up too much space in your suitcase – totally travel friendly! There’s a common misconception that hair oils can weigh your tresses down and make them feel heavy. But this isn’t the case with the VO5 hot oil treatments: the highly advanced technology means the formula is much lighter than you’d expect. This is great news for girls with thin, limp hair, who are often concerned that oils can make their hair look heavy and greasy. Because who doesn’t love coconuts? Always wanted to jump on the coconut craze? Now’s your chance! 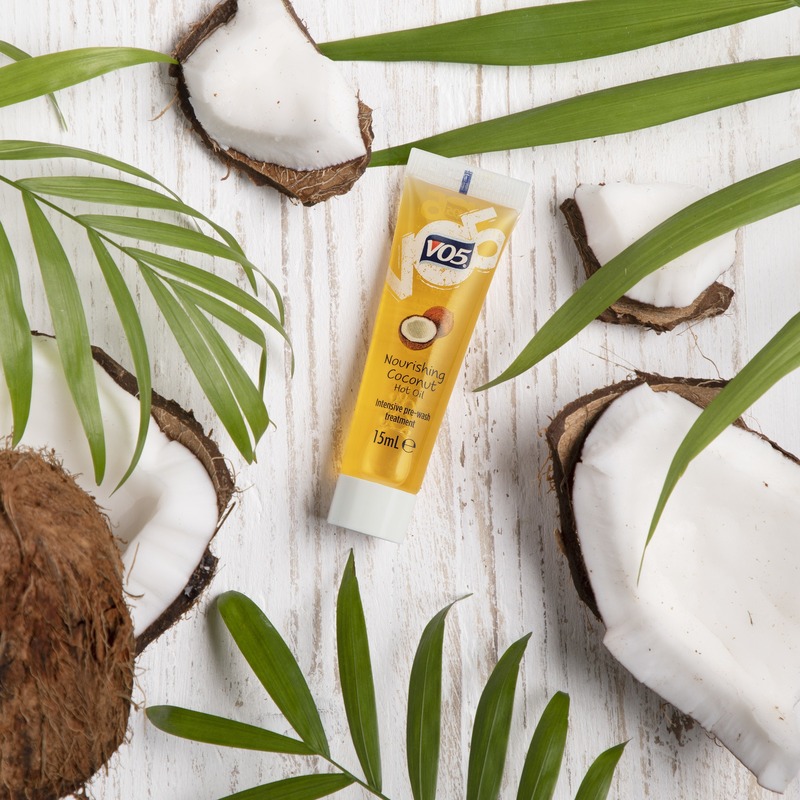 With its lovely, indulgent coconut fragrance, your tresses will be smelling like a tropical island in no time. 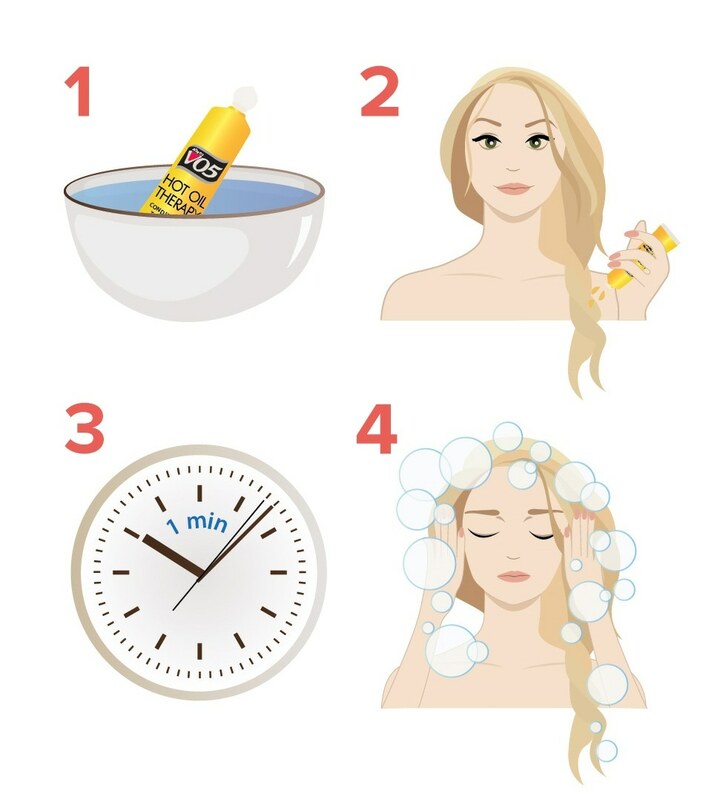 How to use the VO5 hot oil treatment. Once a week, remove one of the tubes from the packet and place it in a mug of hot water to heat it (alternatively you can drop it in your bath or under a hot running shower). Once it’s heated, break the cap open and apply it to damp hair (avoiding the roots). Massage the oil into your tresses, focusing on your ends. Leave it on for around 1 minute before rinsing thoroughly. Finish by applying shampoo and conditioner as normal. *Note that while you might not be able to save strands that are already split, using hot oil treatments can help to protect your tresses from future breakages in the long run. What is a hair gloss treatment and why is everyone raving about it? The secret to luscious locks? A protein treatment for hair! Which hair straightening treatment is right for you?